This mosaic is a commissioned piece created to capture the spirit of unity at Penn State University's DuBois Campus. It is mounted in Swift Building Lobby. 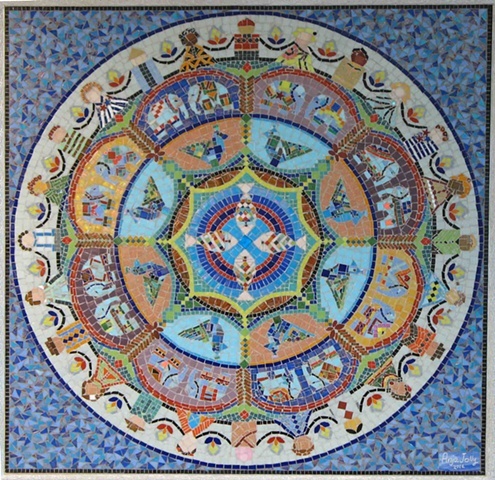 This mosaic depicts a sphere in which all of life is connected. The outer circle represents the diversity of people and cultures on earth. Other circles show animals from eastern and western geographical regions, reminding us of our global connection to nature and the earth. Vibrant colors and designs work together to produce a dynamic energy. The message of this picture is to ‘let our diversity be a uniting force’.